Wooden handle has a pushbutton fold mechanism to fold it back for storage. All interval parts have been toughened and have gear durability twice higher than the industry standard. Highly rigid fluted disc and steel rack bar transmission structure make it work smoothly. 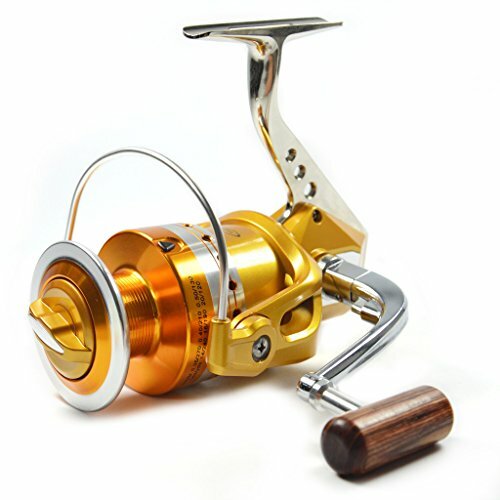 Premium quality aluminum sea fishing reel with a series of in sizes from 1000 to 7000, solid and durable,Left/Right interchangeable,support for both sides and operate steadily. All interval parts have been toughened,gear durability is twice higher than the industry standard. Highly rigid fluted disc and steel rack bar transmission structure make it work smoothly and help catch fish without any effort. Perfect rigid aluminum spool and foot,100% metal rocker with strong driving force, make it easier to catch big fish. We provide our customer with excellent customer service.If any problems,please contact us firstly and we will solve it for you soon.